In order to meaningfully engage the soul, we must turn to our heart. Every human body contains a heart that emits an electromagnetic field in the shape of a torus. It moves out the top of the head and back in through the base of the spine in continuous motion in both directions. The heart’s electrical field is sixty times greater than that of the brain, and its magnetic field is 5,000 times greater than that of the brain. The heart generates the strongest electromagnetic field in the body, and its pumping action transmits rhythmic information patterns to the brain. The heart actually sends more information to the brain than the brain sends to the heart. It seems that the heart has a mind of its own. 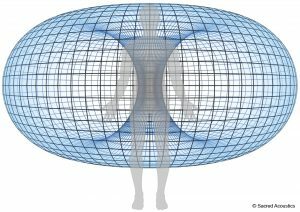 Studies reveal this electromagnetic field, which extends several feet or more outside the body, seems to pick up information in the surrounding environment and also broadcasts one’s emotional state out from the body. Emotions such as greed, anger, or sadness correlate to a constricted heart field, while positive moods such as gratitude, joy, and happiness correlate to a larger, more expanded heart field. As you observe your breath during your daily practice, imagine your breath is moving in and out of the heart. Note in your journal if this exercise assists in lessening distracting thoughts or any other sensations. Our heart develops before our brain in the fetal phase. That says a lot. Yes, the heart works in resonance with external events. And, if the reaction to an external event is manifested in me in the form of emotions, then inside I have something related to this event. wonderful meditation. You see, I have used the CD 4 times for my journeys and today I had a remarkable session. I felt I was flying in the air over a beautiful field, it was like a miracle. I couldn’t believe what was happening in my dream. I love this meditation and am so happy we have arrived in the heart at last! Mystics and holy men & women have known that the heart is the centre of consciousness and the seat of the soul since humans first arrived on this planet. It is wonderful that science is now beginning to understand this too although it’s taken them long enough to get there! Sufis have always known that the heart is the doorway to the world of spirit and the means by which we discover our true path in life. Their primary method of meditation is the “Dhikr” or “Remembrance” of God. This is done by repeating one of the Arabic names of God (most commonly “Allah”) with love in each breath, silently or aloud. It starts in the head but after a while descends to the heart before eventually spreading to every cell in the body. The Christian mystics use an almost identical method in the “Jesus Prayer”. The ancient Taoists in China also knew this for in their energetic system they called the heart “the Supreme Controller” (or internal Emperor). The heart was considered to be where the Spirit (or Shen) lived and through it we found the Unity of the Tao and our true spiritual path. Real healing could only happen when the healer was completely in touch and in tune with their own “Shen” and when his or her Shen connected directly with that of the patient. The heart is is part of the fire element and associated with joy and wisdom (as opposed to intellect or cleverness) whereas the brain was part of the water element and associated with fear, will power, ambition and intellect. Both are essential for us to survive in this earthly realm but the modern world has centred itself more in the brain/water area than the heart/fire area which has made things off balance and removed/separated from Reality. I always believed that the heart was far more powerful because it is one of the first organs to develop. We use the term heart broken for a reason, and as we all know, is a valid physical condition. Our heart has an intelligence of its own, although I was never taught that in biology or physiology class. I love the work of the Heart Math Institute. Thank you for another wonderful lesson. Karen & Eben, I can not Thank you enough for writing this message today!!! Margaret, thank you also for your information. I will pick up Glenda Green’s book you spoke about. Several years ago, one of our organizers for our spiritual group did his usual guided meditation. I must have been in a deep meditative state because when I opened my eyes, I saw a grid that extended out about 2.5 to 3 feet from him but it had a wave and it was around his legs and first chakra. I thought it was a dimension as I did not understand what I saw until I just read your article! I even went to a channeler who couldn’t tell me what it was. She was able to tell me that when spirit had come in me at another time, the heavy feeling in my first chakra was my ex fiancee going through his life review. I have seen energy and I have had some mystical experiences after my NDE. I am so grateful for you writing this article today. I have been really wanting to learn more about the electromagnetic fields too !! So excited……. Is-it possible that a defibrillator pacemaker affect the magnetic and electrical fields? The Shape is the same? I understand your question now. I expect the energetic heart behaves similarly in all of us, even with the pacemaker. Think of that electromagnetic field as being managed by your thoughts and emotions. But you ask a good question. I’ll check the HeartMath literature to see if they have researched that factor. Or, perhaps someone else has the answer. Feel free to post any appropriate references. I was delighted to see the reference to HeartMath research mentioned! I serve as a HeartMath Resilience Trainer and guide others in the awareness of our 3 brains, Head, Heart and Gut. I have witnessed and personally experienced amazing results using the HeartMath techniques. Thank you for sharing the information with the world! I was delighted to find the research from HeartMath included here. I am certified as a HeartMath trainer and I guide others to become aware of their 3 brain. Head, Heart and Gut. I use the HeartMath techniques with my clients and have witnessed remarkable results. I have à defibrillator pacemaker. What happen in this case? We are not aware of any negative effects from putting attention on the heart in combination with a pacemaker. If you are concerned, please consult with your doctor. I agree the information about the heart was amazing and very informative. The illustration was beautiful. Hello all, I was really excited to see the illustration of the heart energy in today’s direction. I have been receiving Heart Math info for a couple of years and have some lovely exchanges with them from time to time. Has anyone read Glenda Green’s book “Love without End” she is an artist and had an incredible experience of meeting Christ so she could paint the picture, “The Lion and the Lamb” He tells Glenda that ” This way to the Heart because it was the souls entry point at birth and will be it’s exit point at death.” He goes on to talk about near death experiences saying that those who experienced that, have lives who are changed for ever because they now have a greater perspective on their spiritual nature and union with the heart. It is a book that brings in, the very least, a lump in the throat. A recognition I think. I am so glad that we are able to see each others comments and replies, it accentuates the feeling of connection with other participants. As usual, love to all with thanks and appreciation. Margaret. Thank you, Margaret for the info!! Helps a lot! Will have a look into it! In Chinese medicine the heart is considered to be the sovereign, with the brain as the administrator. In the west we have turned this upside down and put the administrator in charge. This is like giving all the power to self-serving bureaucrats and diminishing the sovereign to nothing more than a figure-head. I’ve always thought it interesting to note that the brain has built-in barriers to certain molecules whereas the heart is open to everything the blood has to offer. Look at our educational system. There is an enormous amount of money, time and energy put into teaching mathematics and less and less given to the arts. If you want to put someone in their head, teach them algebra. If you want to cultivate the heart, teach them to understand beauty. But the two need to work together, in the right relationship. Heart first, brain second. Math (science) and Art do work closely together. Many studies involving patterns of brain activity during an fMR word association task performed by artists and scientists show strikingly similar patterns of activity in multiple regions of association cortex and areas involved in socio-effective processing. Being a trained electronics engineer specialist in telecommunication (10 years working experience in telecommunication industry and 10 years experience working as a software engineer) myself, I can attest to that. I’ve met a lot of gifted engineers autodidact artists. The same is true for my husband and myself. Ooooo I am excited to see that the studies of HeartMath Institute are cited here today ! Thank you Eben and Karen for sharing .. i am aquainted with this work and helped lots of clients with this knowledge! I use your advice of today on a daily basis .. and its becoming a second nature. Wishing you all a wonderful heart expansion.